President Obama was in Minneapolis- a city once known for a double digit murder rate - to promote his plan on curbing gun violence. He asked supporters to call on Congress to act. NBC's Peter Alexander reports. Declaring “we're not going to wait until the next Newtown,” President Barack Obama appealed directly to the American public on Monday to pressure reluctant lawmakers in Congress to move forward with gun control legislation. Obama flew to Minneapolis, Minn., to urge constituents to contact their representatives and press for a package of new gun laws, including a ban on assault weapons and high capacity magazines, universal background checks for gun buyers and new rules targeting gun traffickers. “We don’t have to agree on everything to agree it’s time to do something,” Obama said, standing in front of a group of uniformed law enforcement officers. Obama’s campaign-like strategy is designed to maintain a sense of urgency for gun control measures in the wake of the elementary school shootings in Newtown, Conn., that killed 20 elementary school children and 6 adults. But the president conceded Monday that his plans already face steep hurdles in Congress. Obama’s remarks in Minneapolis reflected the political realities on Capitol Hill, where Democratic leadership aides privately say an assault weapons ban has little chance of passing. The fight will instead center on universal background checks and, some Democrats hope, high capacity magazines. On Monday, Obama labeled universal background checks as “commonsense” and “smart” reforms that would earn bipartisan support. “There's no reason why we shouldn't be able to get that done,” he said. 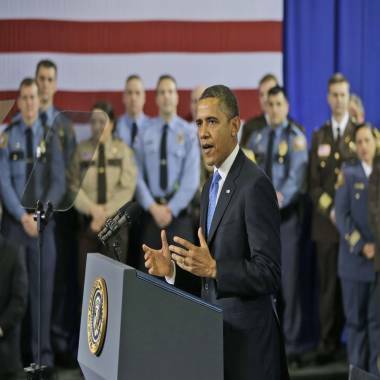 President Barack Obama gestures as he speaks about his gun violence proposals, Monday, Feb. 4, 2013, at the Minneapolis Police Department's Special Operations Center in Minneapolis, where he outlined his plan before law enforcement personnel. There’s some evidence of that: While the National Rifle Association says it opposes universal background checks, Republican Sen. Tom Coburn of Oklahoma has been working with New York Sen. Chuck Schumer and other Democrats to craft background check legislation. For the politically difficult elements of his proposals – the bans on weapons and magazines – Obama set a more modest goal: “That deserves a vote in Congress,” he said. That’s about the extent of what Senate Democratic aides say they can muster. Majority Leader Harry Reid, D-Nev., who earned a “B” grade from the National Rifle Association, said Sunday on ABC’s “This Week” that he plans to allow the Senate Judiciary Committee to start writing a gun bill. If it doesn’t initially include the ban, senators could try to add it later in the process, as an amendment on the Senate floor. Reid has no plans to introduce his own gun bill, a senior Democratic aide said Monday, instead leaving that process to the Judiciary Committee, led by Chairman Patrick Leahy, D-Vt. Still, aides acknowledged, including a gun ban in the overall package could prevent other, more popular gun regulations from passing Congress. Democratic aides say Leahy hasn’t yet decided exactly what he’ll include in the bill, though he’s introduced a measure that would crack down on people who illegally buy guns to give or sell to others. Before the committee starts writing a bill, planned for later in February, there will be at least two more hearings – one this week in the Constitution Subcommittee and another full committee hearing after that. Congress held its first hearings on gun control late last month, where National Rifle Association CEO Wayne LaPierre clashed with Democratic senators and emerged in opposition to universal background checks. Obama referred to lobbyists like LaPierre in his remarks, though he didn’t mention the longtime gun advocate by name. He urged Americans to tell Congress if he didn’t speak for them. Speaking at the Minneapolis Police Department's Special Operations Center in Minneapolis, President Obama, says, "We don't have to agree on everything to agree it's time to do something." Watch his entire speech.